In Earth Angel: A Guide to Finding Your Wings, Sonja Grace brings an entirely new perspective to the angel genre. She has been traveling and working in the angelic realm for over 30 years is dedicated to Divine love and is an Earth Angel. Our planet has moved into the fifth dimension and we are about to witness a new order of earth angels. Hundreds of thousands of people are beginning to feel a calling to their spiritual light. Yet, some feel misunderstood, different and in many cases extremely sensitive and intuitive about people and events. 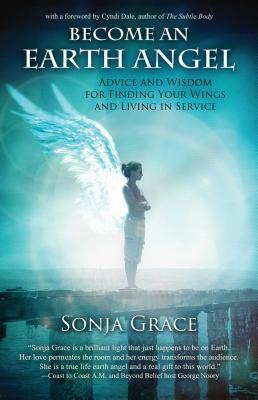 Sonja Grace was destined to write Earth Angel: A Guide to Finding Your Wings to assist those emerging souls who are searching for answers and hoping to discover their path of service and their spiritual connection to the divine. Through her own extraordinary case studies, Sonja Grace reveals what it is like to do the work of an earth angel and how she has used her gifts to locate missing people, conduct long distance healing and council a myriad of international clients. Readers are taken on a journey into the angelic realms. Sonja Grace offers fresh insight and descriptions along with explanations of the angels and the earth angel phenomenon; what they are, how to identify them, what they do, where they come from and their particular mission at this time in the earth’s history. Sonja Grace is a highly sought after mystic, healer, artist and storyteller with both Norwegian and Native American heritage. As an intuitive healer, she has been counseling an international roster of clients for over thirty years. Sonja’s ancestral background is a fascinating blend of Native American Choctaw and Cherokee descent and Norwegian. She has been adopted on the Hopi Reservation, where she is considered a medicine woman. The award-winning author of Spirit Traveler, Become an Earth Angel, and Dancing with Raven and Bear, Sonja has appeared multiple times with George Noory on Beyond Belief and Coast to Coast AM. She lives in Arizona with her husband. Cyndi Dale is an internationally renowned author, speaker, healer, and business consultant. Her books to-date includes the bestseller, The Subtle Body: An Encyclopedia of Your Energetic Anatomy, published by Sounds True. The Subtle Body has garnered over 100 five-star reviews on Amazon.com and continually sells in the top place, leading millions of books. It has also won four internationally recognized Publisher's Awards. "What a blessed book this one is. 158 pages of pure Celestial wisdom right at your fingertips. The exciting feature of this glorious how-to is that it is aimed at those of us who are spirit based and here to help the world. I learned so much about ways we can help, why we help, and even how the realm system works. I feel so honored to help announce this great teacher to its seeking public because I know it is so needed. I would recommend this much awaited guide to anyone who feels they could use a little help in the waking up department. Thanks Sonja, you are truly amazing." "Sonja Grace has been working and travelling in the angelic realm for over 30 years. Her new book brings an entirely new perspective to the angel genre, and it is for those people who might feel misunderstood, different and in many cases extremely sensitive and intuitive about people and events. Grace outlines how to take steps towards being of service to others. Through her own extraordinary case studies, Sonja demonstrates what it is like to do the work of an earth angel and how she uses her gifts to locate missing people as well as council and heal a myriad of international clients. She also takes readers on a fantastic journey to the angelic realms. The reader will discover fresh insight and explanations of angels and the angelic phenomenon; what they are, how to identify them, what they do, where they come from and their particular mission at this time in earth’s history. " "Become an Earth Angel is a fabulous little book. If anyone wants to help others with healing or serving them, this should be read. It doesn’t discriminate on religion or spiritual beliefs, and just truly wants to bring about the most uplifting message of all to help others. Some of the information included in it, may not be for you--but the overall message is what matters the most. If you are open to receiving it, then this book can truly help you to navigate to your greater purpose of being an Earth Angel. I definitely recommend it to anyone who enjoys reading about angels, spirituality, different dimensions, and healing." "In her book, Become an Earth Angel, Sonja shares ways for readers to realize their own brilliant life force and to find the personal power they possess for personal transformation and for creating a better world reality. Sonja is a mystic and healer who offers remote viewing, channeling, past and future life therapy, alien and entity clearing and communication with the divine bringing a new perspective to the angel genre explaining how our planet has moved into the fifth dimension and we are about to witness a new order of earth angels. Hundreds of thousands of people are beginning to feel a calling to their spiritual light allowing for the possiblity that ordinary citizens can align to the higher values of universal energy and work to help each other build better lives and a better world community as the higher forces of Spirit encourage us and guide us to do. READ THIS BOOK to gain a greater understanding of how the angelic forces interact with us regularly and to learn about the qualities that may make you a more evolved angelic force for personal change and for manifesting a happier life."